I always seem to write these “Find of the Month” posts when I have otherwise been highly neglectful of this poor blog! I have been working longer hours over the summer which has left little time for costume projects, but has given me a little extra money. For a weekend treat, Christopher took me to a new antique store we’d been trying to visit for a year now: Maine Barn and Attic Antiques on Highway 199 outside of Azle. The only catch is that Christopher and I both work on Saturdays — the only day the shop is open! We finally got to visit and it was WONDERFUL! Inside is a dreamland. It’s the classic antique store I remember from my childhood before “antique stores” became expensive craft and clothing boutiques with a few overpriced knicknacks scattered about. I have nothing against craftshops or boutiques, but nothing beats a smorgasbord of true antique finds in the rough– dusty, weathered, and crammed in every corner! The Maine Barn and Attic is huge and is packed floor to ceiling with everything imaginable, even a not-so-shiny-but-very-romantic little surrey with the fringe on the top. I wish I’d gotten some interior pictures, but I was so engrossed, I forgot. The place is THAT GOOD. They do have a Facebook page. The prices were all very reasonable and the variety of goods endless. However, they only take cash or check– no credit cards! I did not know that, so I had amassed a small pile before I realized that I didn’t have a lick of cash on me. The proprietors kindly offered to hold my pile (“Happens all the time”) and I returned the following week to pick up treasures…and then some. In the darkest corner of the shop, I was ecstatic to exhume one piece in particular: a black silk stock collar! I found it folded like this in a plastic bin filled with crumbling beaded trim and ric-rac. I literally “squeed” out loud and clutched it to my chest. Some say that George wore them to distract from his chubby face (he was frequently lampooned for a being a larger fellow), but stock collars also helped military officers and civilians alike maintain a ramrod straight posture, projecting strength and control with a dash of mystique. Usually thought of as a Romantic Era (1825-1840) item, stocks were widely worn into the 1850s until fashions shifted to a more boxy, relaxed day look for men. 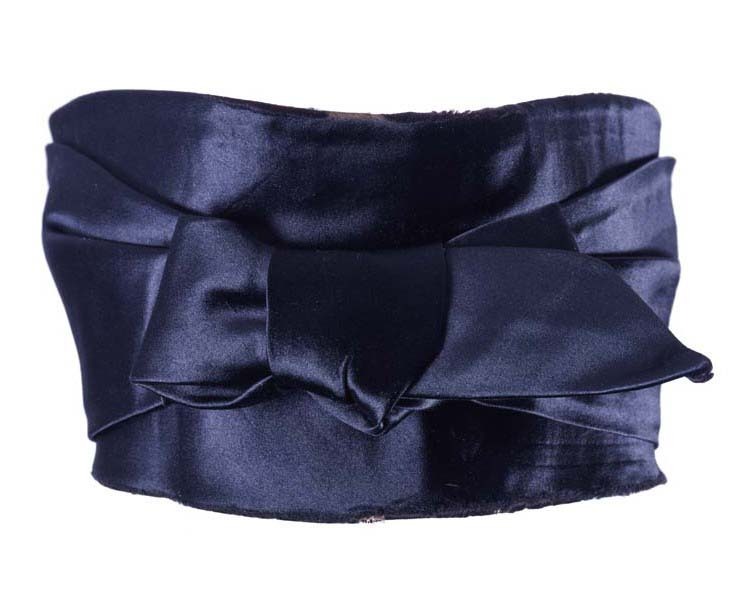 The stock I stumbled upon at Maine Barn and Attic Antiques is made of very lustrous black silk with a very stiffly starched linen collar basted inside. The stock is 15 inches long not including the tab and is 4 inches tall at the center, 5 inches if you include the linen collar. The edges close with a three-pronged steel buckle. The prongs of the buckle are very sharp, designed to pierce directly through the fabric tab rather than to fit through pre-made eyelets. When I first saw the stock, I was struck by just how tall it is! I wouldn’t say I have a long neck, but I don’t have a stumpy one either. 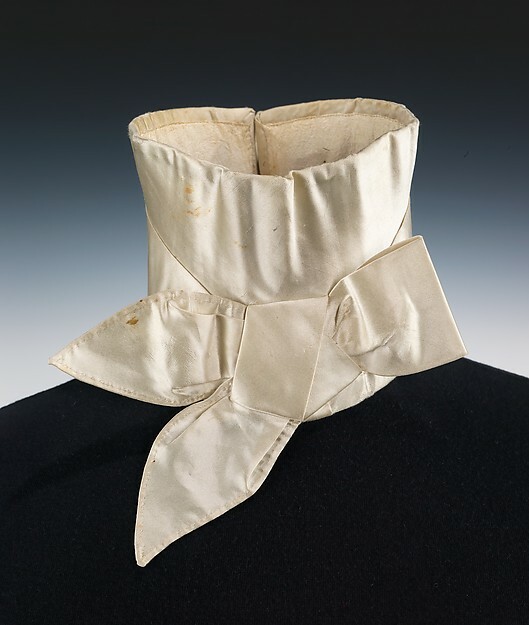 This collar would not fit me comfortably no matter how good my posture is! A gentleman would have to hold his chin tilted quite high in order to accommodate it. You can see the graceful curve in the center. It’s not boned, but the horsehair/canvas interlining is plenty stiff to keep the shape. The collar inside has what appear to be decorative pressed folds (though they may just be from how it was stored). The stock forces the wearer to tilt his chin up in a rather proud posture, very different from the modern slumped posture we’ve adopted with our chins tucked back and down. Such tall stocks are usually found in paintings and fashion illustrations from the earlier decades of the 19th century, from about 1810 to 1835. 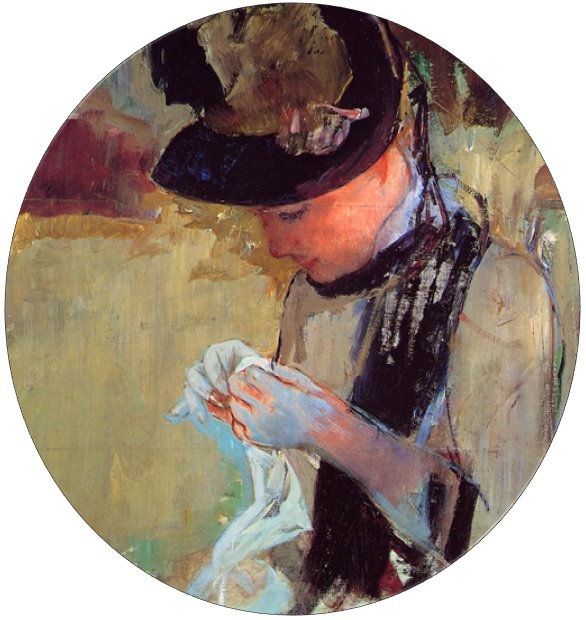 Cravats and stocks create similar looks. Sometimes it’s difficult to tell in drawings and early photos which is which, but they could be worn together as well. For a lovely collection of late Georgian fashion plates showcasing some impressive neckwear, click here. Thanks to its size and styling, I thought for certain I had a Georgian stock from around 1825-1835 in my possession. However, when I folded it open and took a closer look, I discovered some damning–albeit awesome–proof that my stock isn’t as old as I originally thought. The inside is in rough, but not terrible, shape. The collar is still papery crisp from the last time it was starched all those years ago. It is mounted on a neckband that has a pointed dip in the center to somewhat follow the lines of the stock. Other than the large basting stitches holding the linen collar on (which are kind of sloppy even for basting. One basting stitch even nipped through the black outer silk. If you look close at the pics of the outside, you might see the tiny white blip) everything is hand sewn with absolutely beautiful, tiny stitches. 19 stitches per inch– yes, I counted! Compare the stitches to the tiny fashion magazine print on the left—each stitch is barely the height of an i! I also discovered the greatest gift any random antique object can possibly give: The original maker’s stamp, clear as day, fabulously green, and perfect! I HAD to look the company up! And I found…..a modern pipe fittings company that started in 1924. Hint: this stock is far older than that. But the Wards Manufacturer that made my stock did me a huge favor: they included not one, but two addresses in their stamp! So, where would a gentleman need to go in order to buy this stock? I looked up both addresses and quickly realized that this stock was going to push me down a deeper rabbit hole than I had anticipated. As it turns out, the old part of North 5th street has been renamed Independence Mall East. You can search for the address in google maps, but it is now part of Independence Mall– mere blocks from Independence Hall and right across from the Philadelphia Mint! The shop is now a parking lot; the building was destroyed in the 1950s to clear the land for Independence Mall. 40 North 4th was also lost to time; it is now near a modern office building. Approximate Locations of 116 North 5th and 40 North 4th in the modern world. Neither of these addresses belong to buildings anymore, so Google only offers approximations. I refused to resign myself to this unsatisfactory answer. Greater Philadelphia GeoHistory Network to the rescue! I found this amazing research website through this “How to Research the History of a House” packet. The GeoHistory Network website is chock-full of amazing features for anyone wanting to research historic Philadelphia. The most fascinating tool is the Interactive Map Viewer which allows you to view, at full scale, antique maps overlayed over modern Google Maps, so you can find exactly where something was even if that street or building doesn’t exist anymore! And guess what: I found 116 North 5th street! The most detailed map is the 1875 Atlas map, which even has some lots and businesses labelled. Here, you can see 116 (labelled with only a 16) across from Appletree Alley/Lane, a street which once ran where the Philadelphia Mint is now. 1858 Map of Philadelphia is the earliest map with clearly marked building numbers, proving that 116 N. 5th existed back to at least 1858 in the same location. There’s also a great vintage photograph of this same section taken in 1949. These buildings were also leveled in the Independence Mall project. 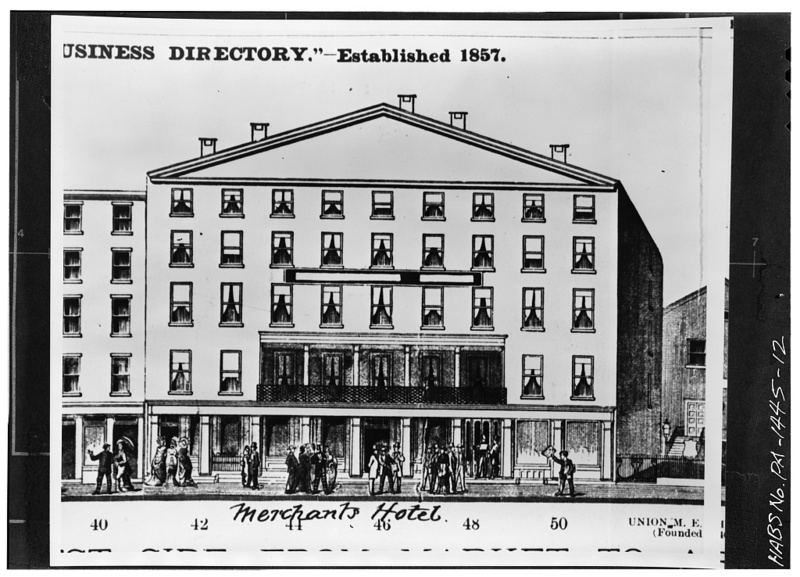 Unlike 116 N. 5th, the 4th street address is labeled with a name on nearly every map: It’s the Merchant’s Hotel! The Merchant Hotel was built in 1837. On the bottom floor were spaces rented out for shops. It was not demolished in the Independence Mall project, but burned in 1966, so it’s no longer with us either. 40 N. 4th street was either in or right next to the hotel, depending on the street numbering that year. No one said doing research was easy! Since the Merchant’s Hotel wasn’t built until 1837/38, my stock could be no older than that. The GeoHistory website had another tool to share with me: a digital library of City Directories dating all the way back to 1785! City Directories were the phone book in an era before phones. It listed every tradesperson, their occupation, and their shop’s address. I dove into the directories starting at 1837 and I emerged triumphant! 1837: His first appearance at the address listed on my stock, 116 N. 5th Street. He is listed as a general dry goods seller. 1839: George W. Ward decides to specialize in manufacturing gentleman’s stocks. Philadelphia had a large garment manufacturing industry and there were a few other stock makers/manufacturers in the area besides Mr. Ward. 116 North 5th Street placed him right in the midst of the bustling shopping district. 1840: He’s still there! Merrily manufacturing stocks on N. 5th Street. 1841: BINGO! Mr. Ward expands his stock manufacturing business to a shop in the Merchant’s Hotel. This is the first year that both addresses are listed in the directory as they appear in the stamp on my stock. 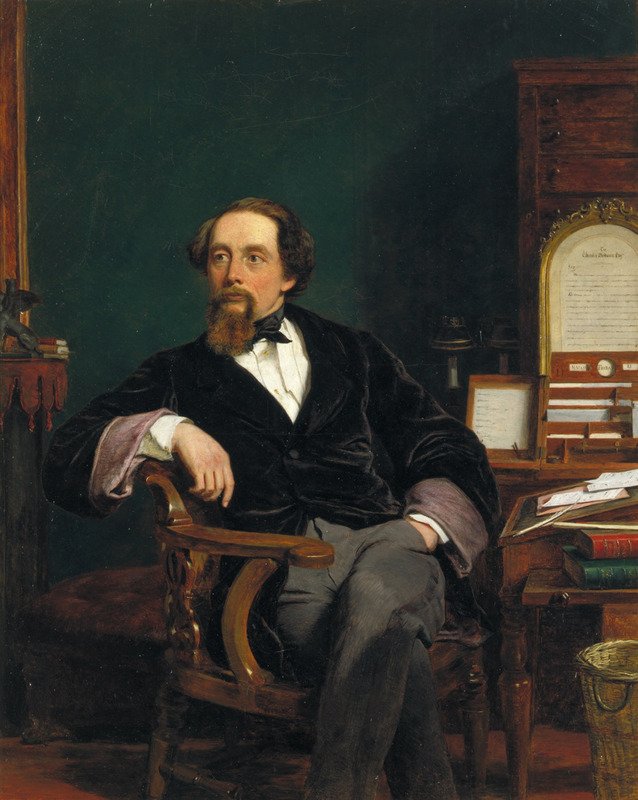 1842: Putting his stock in stocks! 1844: Still merrily manufacturing stocks! 1845: Mr. George W. Ward is no longer making stocks, but moves shop to #38 (from the engraving above!) and decides to go back to the dry goods he sold before, but this time with a specific, posh clientele in mind. “Furnishing” in this case is not furniture for a room, but men’s clothing and accessories. As a gentleman’s furnisher, he would have still sold stocks, but he likely outsourced production to a different stockmaker. 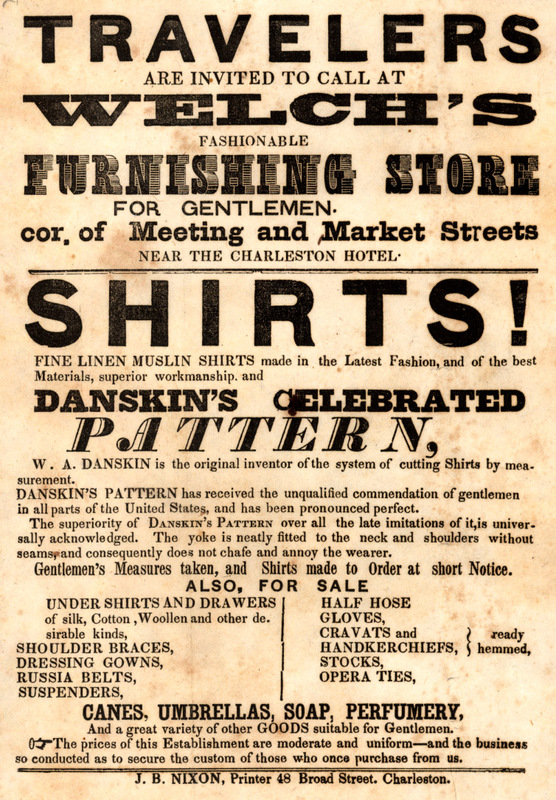 An advertisement for a Victorian furnishing store. Mr. Ward’s shop would have sold similar items. Mr. Ward certainly liked to stay busy! From all this, I know that my stock must have been made between about 1840 and 1845. Less Mr. Darcy and more Charles Dickens, but still very exciting! 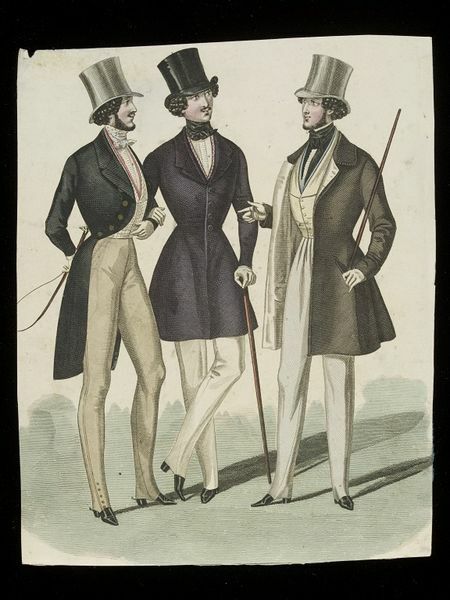 1840s Fashion Plate showing three fashionable gentlemen. 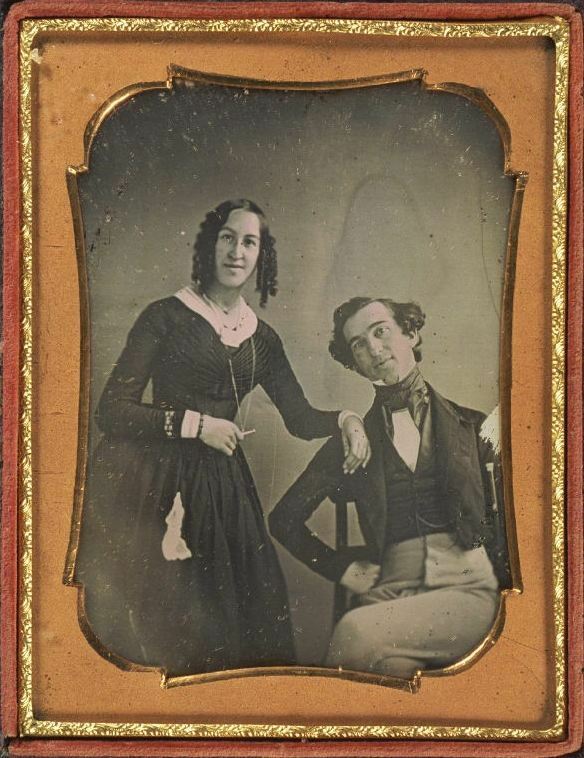 Daguerreotype of the cutest 1840s couple ever! You’ll notice there are a few other quality stock manufacturers in Philadelphia at the same time, so he might have run in to some fierce competition that prompted him to diversify. I’m no expert on 19th century stocks, yet I can instantly feel how well-made mine is. I mean, it has survived for over 150 years in very good shape! I am so happy to have found it– and at $9.50, it was an excellent bargain! Enjoyed reading your history adventure. Terrific post. I admire all your excellent research. Glad you found such an interesting treasure. How absolutely fascinating – you certainly did lot of research – and thank you for that. Fabulous post – so interesting, all your research. Fascinating. Reads like a detective story. I will now look at men’s neckwear quite differently. 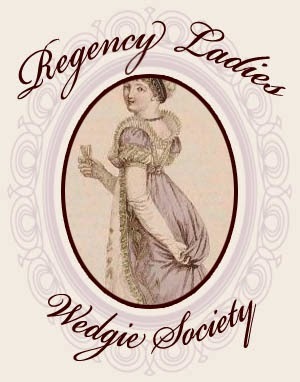 Excellent post about an article of clothing with such an interesting history…your find in the antique shop was truly destined to be yours to share! This is wonderful stuff. You should publish a costumer’s mystery novel. You are amazing! Thank you for sharing and doing the extensive research to pin down time and place. Very interesting! 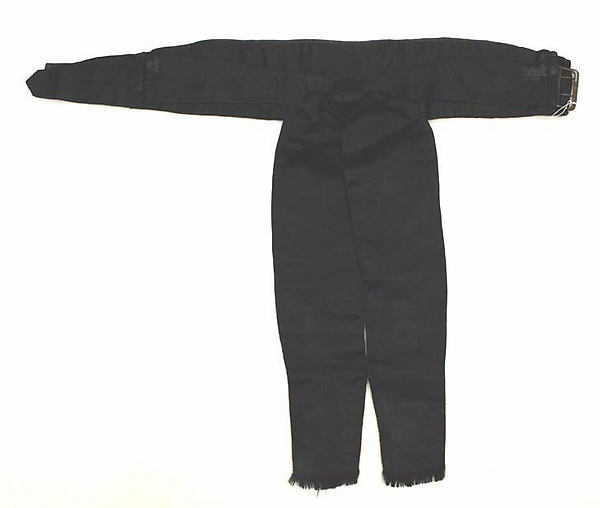 The square symbols on the inside of the stock is probably what is called now “pig-pen” or rosicrucian code, but it was used as a stock code prior to the Civil War for haberdashers and dry-goods like clothing for putting pricing on items that the buyer would not be able to read. This form of code was also used to construct one of the principal codes developed by the CSA, which was polyalphabetic (multiple alphabet) code including these symbols, that was broken by the Union side because one of the code-breakers had worked for a haberdasher before the war. It was also used straight as a cypher for various people during the war. Another aside is that the proprietor of the Blue Hippo hardware in Portland Oregon uses this code for labeling his prices on the larger items like tubs and sinks, doors and mantelpieces, He has not agreed to explain to me how to decipher it. Great find, by the way, and amazing follow up on the clues. The simplest resolution is to make a cross-hatch like a pound symbol, and put the numbers 1-9 in the spaces, and then use those shapes to represent numbers. I don’t know how to represent zero and decimals, but I can think of a couple of workarounds. I don’t think it would be workable with the pre-decimalization British Pound/shilling/pence system though. First, I love your blog! I never knew I would find costuming interesting, but I found your blog awhile back and was hooked. I love love love all the research and documentation you provide and it is so fun to see how you bring all of this to life in your designs. thank you for all the effort your put in. Second, these sites helped me crack a major mystery in my family genealogy! I have some family who spent time in Philadelphia in the 1850s and these links are incredible! The maps and directories enables me to locate the address of my ancestors and trace their time there. What fun it was to get such a breakthrough. The GeoHistory website is a goldmine! It’s a real researching treasure. I am so glad it helped you in your genealogy quest!